Slim, structured support for tighter fitting or lightweight footwear. The Black Footbed is particularly suitable for shoes without removable insoles, and are recommended for all arch types. 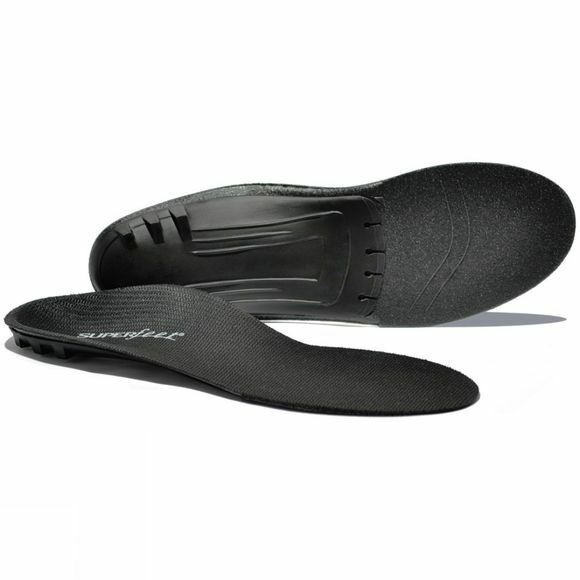 The three keys to every Superfeet footbed are a structured heel cup, which encapsulates and positions the soft tissue directly under your heel which helps to maximise the natural sock absorption in your feet. The rear foot support, which you can sometimes feel towards the back of your arch and the front of your heel, which helps to stabilise your foot reducing the chance of fatigue throughout the day. Finally there is the firm foam stabiliser cap and subsequent layer which combine to create the supportive shape that superfeet are famous for. Suitable for vegans and free of latex, nickel sulfate, formaldehyde and preservatives.